James Bond meets grunge in this stunning black & blue styled wedding shoot. The Forest Hall at Chatham Mills was a perfect location to style a table full of lush greens and blueberries. Matte black accents, including the cake, break up the sea of blue and green. The How We Gather shootout that I attended in March was truly an experience I'll never forget. driving nine hours from Pennsylvania I was nervous. Would this be worth it? It was and then some. The team at The Gathering Co. spent countless hours pulling in vendors from all over Raleigh, creating this vision. Light poured in the white walls, as the engaged couple snuggled in. 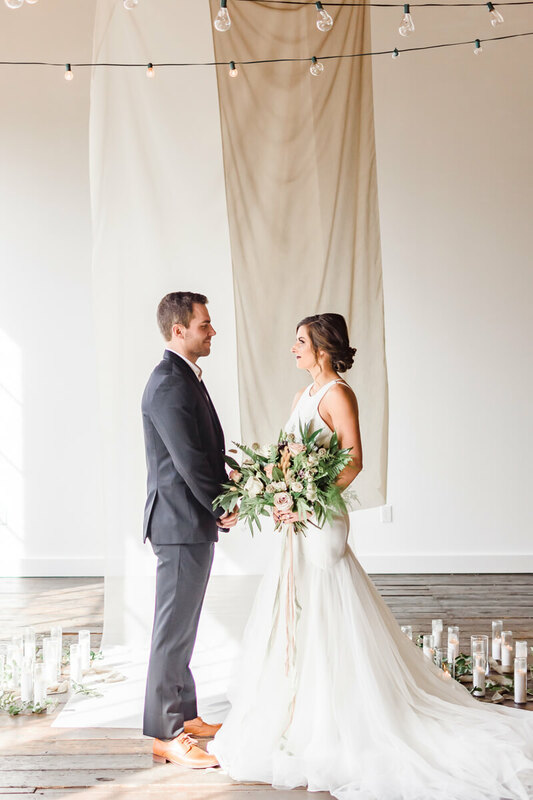 This was a perfect rehearsal for their upcoming wedding day, and their connection illuminated each frame.